@Ranshi922 Thursday. The elimination follows thereby and shortly thereafter begins the second challenge. To be really correct. The deadlines will fall on each Friday 10:00 London time. (Thus giving everyone the whole of Thursday regardless of where they live. And with that, it's time for Aggrol to meet this new character in another Story Blurb! After the incident in the caves, Aggrol knew that he couldn't just go running around wherever he wanted. He needed a guide. He knew that the earth saw everything, so he knew that that an elemental would be the perfect guide. 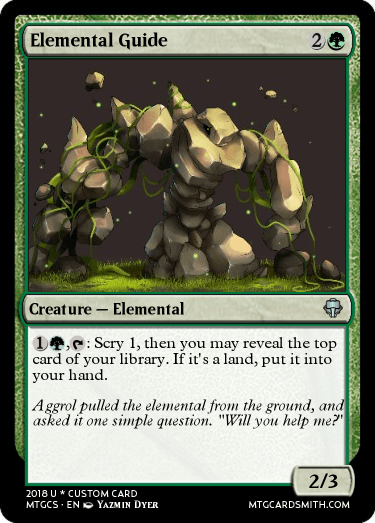 Aggrol pulled the elemental from the ground, and asked it one simple question. "Will you help me?" "That depends. What do you want my help with? I have not seen another of my kind in thousands of years. What are you doing here?" "Well, that's the problem. I don't exactly know where here is. The only native I have with me is my hydra, and he can't speak." As if to prove Aggrol's point, the hydra opened it's mouth and let loose a roar, as if it was trying it's best to speak. The elemental respoded warily. "Well, you're not from around here. I suspect with the way you were coming you were just at Gewar. Why didn't you ask them for some maps?" "I did, but the range of their maps was very limited. I need a further reaching, more permanent guide. By the way, what's your name? Mine's Aggrol." "My name is Samora, but you can call me Sam. Now what's this about a permanent guide?" "I am going on a long journey, and I need someone to help me know where I'm going. I just fell into a pit with a bunch of goblins and a demon. I want to avoid that in the future." "Wait, did you say a bunch of goblins and a demon? And you're still alive? How?" "Well, I killed the demon. Apparently it's weakness was water. Who would have thought?" "You killed it? Holy crap! That thing was imprisoned down there for a reason, Aggrol! The fact that you managed to get out alive is impressive enough!" "Well, I do still want to avoid any more demon pits. It wasn't an easy fight. I almost died. Will you help?" "Yes! Of course I will! It would be an honor." "Hold on. I don't want to be treated like royalty. We can travel together and be friends! What do you say?" "OK! Let's do it!" Sam said as they shook hands. And they continued on into the great plains. Well, there's the third main character! This is the best way I could think of to solve the problem without being blue yet, so yeah. Also, I already have... extensively told my surroundings. See previous Story Blurbs. Oh! We are adding colors? @Ranshi922 Eventually we can, yes. 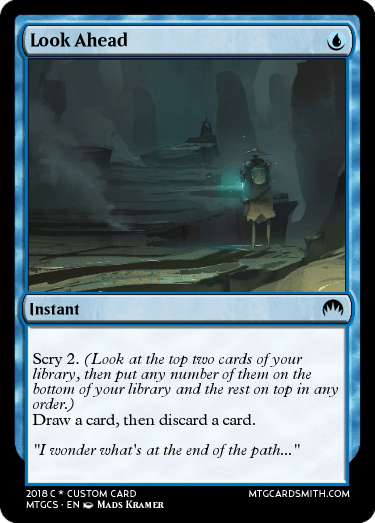 I was just saying that it would be easier to create cards for this if I was able to add blue to my character right now. What sort of tournament? Also lucky! I wish I had something better to do like that late night! Here is my entry for the challenge, filling in the extra uncommon as this is a slightly better version of Treasure Hunt. AxNoodle did not just stop at the Guide. He went though book after book, looking for any information about where he was and what this mysterious ball was. The lore, basically, is that Aldor finds some friends (who, yes, are owls. I couldn't find much more goat art) who, in exchange for food (life) will help him in his journeys. I might write a story sequence about it later. @Jonteman93, I feel as though I have been lost. Are there any benefits to not making the max number of cards every time? A broken full-body suit of armor held together by magic with glowing red eyes was wandering on a land filled by endless craggy grounds and sands. The armor's dark coloring and intricate ornaments emitted an aura of malice to the lesser beings. In truth the armor-bound spirit was a lonely person. Days came to nights, and time escaped like a brisk wind. Still there was no civilization in sight. Had the dark spirit be a still-living human, he would be perish long ago due to exhaustion. Then in an evening, he saw lights of civilization at the horizon. 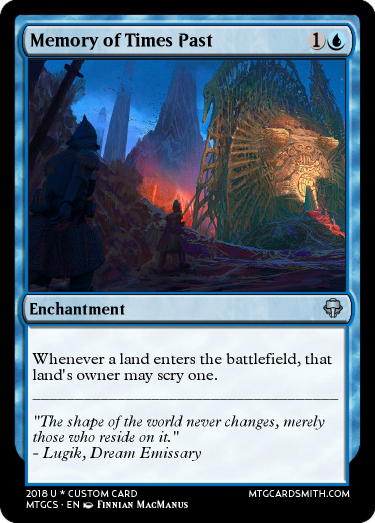 The lands were also changed. There were lush and green vegetation around the city and beyond it. A stark contrast to the broken lands he was currently trudging on. And with a solemn determination, the armored figure slowly moved himself towards the lights of civilization. 'Well well well, looks like it's a glorious night for a grand forced-charity action.' Smirked a person in a typical civilian attire for a medieval-era civilization. His clothing was of course very inconspicuous for a thief after all. But beneath the attire was hidden the necessary stuffs for survival in the city and in the woods alike. The said person was currently hiding in his secret and sophisticated treehouse hideout that located in the forest outside the city along with several children who were abandoned from the civilization itself. "Good luck, boss." Smiled a young boy in a not too shabby attire, for a homeless boy in the medieval era of course, as he pulled the rope-ladder away back to top. "Keep your eyes open for trouble, Bill." Said the adult who then walked away from the fairly high-located treehouse. "Sure thing, boss!" Saluted the boy. The moon was shining brightly that night, so the need for a torch wasn't necessary for a person to walk in the forest at night. An abnormal rustling in the bushes around him then happened. And with a reflex of an experienced thief, the thief pulled one of his survival knife and readied a stance in a crouched position. A horned adult deer then jumped away from the bushes towards him, and he barrelled to the side due to the surprise. "Cursed animal." He muttered as he stood up again and resheathed his knife. Just then as he turned around, in front of him stood a dark and menacing armored figure with glowing red eyes. "By the gods!" And the thief fell to his back. "S-so... you need a... help?" Muttered the thief as he stood in front of the armored figure. And although he had the ability to run away, he couldn't do that due to the fear aura the armored figure exuded. "I could just kill you and turned you into a useless rotting corpse in many ways, but something inside me held me back. A speck of humanity, you call it. But I also need to rebuild my empire in a way where I have the trust of the people." Spoke the armored figure in an audible whispering voice. "Well, I'm sorry but... how could I help you then?" "For the time being, you shall be my informant about the stand of this current world and more. And in return I could give you a protection and help when you need it." "That's a... nice offer but-"
"Don't attempt to fool me, mortal. A thief like you must be in a very tricky situation everyday. And it would be sad if something happens to those kids." "Wow wow wow, stay back from those kids, you... dark spirit of-"
"I have no intentions to harm those useless children, but you know you need someone to watch your back in case an... unfortunate situation happens to you." "I..." The thief was silent for a moment, with eyes closed. His knife was still tightly gripped by his right hand. "Do we have a deal?" The armored spirit stretched his hand. The thief dropped his knife and grabbed the hand. "Good. Now hold on for a moment." The thief dropped down and screamed. "W-what have you d-done to me..." He said as he clutched his head. Blood was dripping down from his nose as he noticed that the dark-armored spirit just stared at his act. "Don't be a whiner. I was just probing your mind a bit for some informations. It will fade away shortly anyway. We'll see later then." The armored figure melted away into smoky substances, and then he vanished. "Ugh, I think I'm gonna need a drink..." Muttered the thief as he was still clutching his forehead. Ranshi922 Yes every week 0 , 1, 2 or so of you will be taken by the "spark-eater", thus eliminated from the game. The benefits of not using all cards directly is because cards made for the current challenge will be valued twice as much during that week. So if you feel you need a boost to your points then you can use more card slots. If you feel rather secure then you can save these slots for later when you'll need them. Fair enough and I don’t think a burn mate would be great in the challenge anyway. 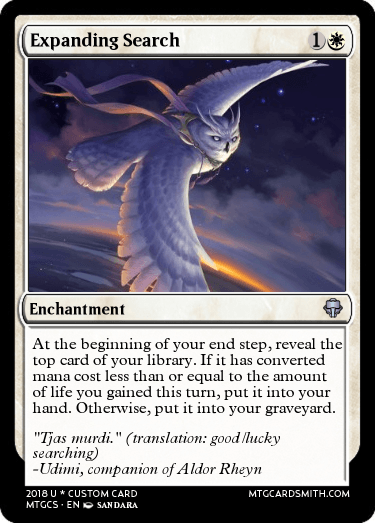 Hailing from the plane of Iquatana, (https://mtg.gamepedia.com/Iquatana) Lugik had been a recognized scholar of the Iquati people, and he never revealed his somewhat unorthodox methods of gathering information for his studies, which were used to promote public knowledge. He would use his dreams as a driving force for his studies, and recorded them regularly. That is, until he had a nightmare. He dreamed of a monstrous force that devoured entire realms without remorse, leaving behind only the ashes of the landscape behind it. The intense fear felt from the dream ignited his spark, and now he is here, in this unknown realm. In fact, he's still convinced he's dreaming, despite the fact that he can't wake himself up. Now, however, in this new world, Lugik has concluded that to wake up, he must reach the story's end, as with every other dream. But first, he'd need to know where he was. Zaha started to wander on this unknown plane. He noticed that he wasn't able de leave freely. So he decided to do what Eldrazis do, processing and consumming the world. He invoqued fews minions and found a weird book in a crumbling temple. The book was able to speak and told him that he could help hin to unravel some mysteries related to this place. @ZAHADOOM It looks like a creation of a 12 years old. 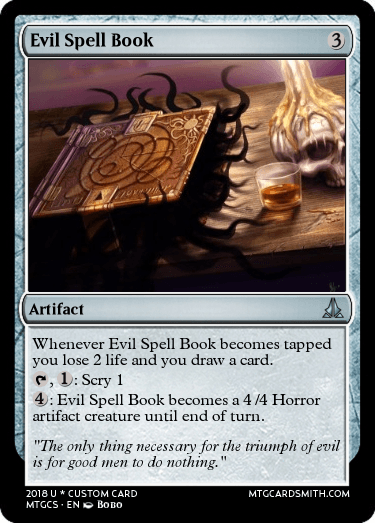 I'M SO EVIL SO I SHALL CALL THIS BOOK MY EVIL SPELL BOOK. Jk, my dude. Nice effect though, seems overpowered too. I finally got a little time to read your story segments and other questions. @Aggroman15 I think it's better to have a soft start and not jump forth too fast with a new color directly. It would prevent the fun in being limited to only one color. You will be given the opportunity to add a color before too long. You could say "third time is the charm." 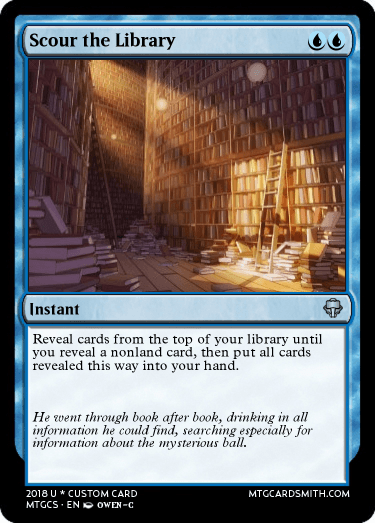 @DoctorFro The challenge is that you create a card that can in some way dig into your library. 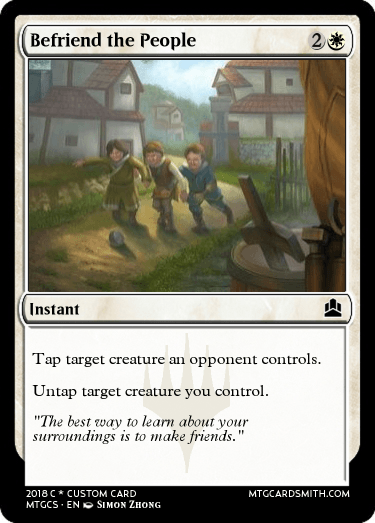 Your card has a good theme but it does not provide the user with knowledge/insight/exploring. You could keep the card as a standard card however if you want. Also I think I forgot to mention. Challenge cards does not need to follow your niche since that would be very difficult in some cases. 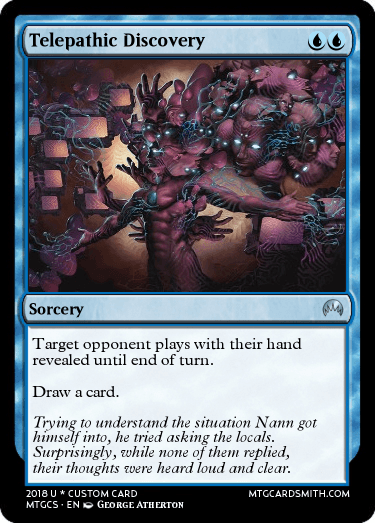 Your niche is just a base line/a way of thinking for your planeswalker, not a rule for what he/she can or cannot do. 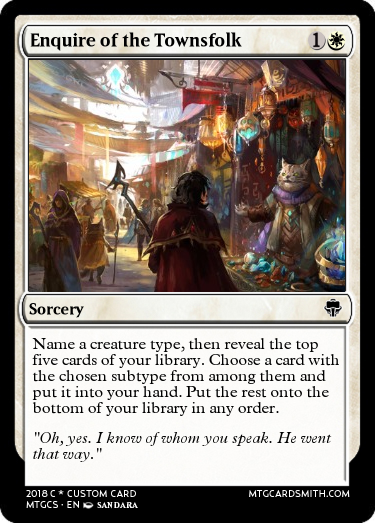 So @Ranshi922, You don't need to burn your way to knowledge, but if you want to keep your cards for future challenges (or just any card) then that is your choice. I hope that was everything at the moment. @Jonteman93 How many cards can you submit for each challenge? I hope I don’t sound rude, but can I ask when the next round/challenge is? It’s alreasy been a few days past the 31st, so I was just wondering. @Jonteman93 does it matter waht cmc this card has? Aldor entered the bustling marketplace warily, wrapped in many layers of cloth to hide what he was. He looked around him at the stalls and stores filled with exotic items, wondering who to question. "You! With the cloak!" a voice came from a nearby stall. Aldor turned to see a cat in a stall, nearby a basket of strange crystals, waving. "All that seems uncomfortable, and is definitely unnecessary." "What do you mean?" Aldor asked, feigning innocence. "Firstly, I'm a cat," the cat replied. "And secondly, I've seen some strange folk passing by. A person made of rocks. A humanoid tiger. A bipedal goat is nothing extraordinary." Aldor nodded and threw down the clothing (which was, as the cat guessed, uncomfortable). "Let me ask you something," Aldor walked over to the cat's stall. "You said there were others. Which directions did they go in?"